Hugh Hanson joined the School of Drama faculty in 2015. 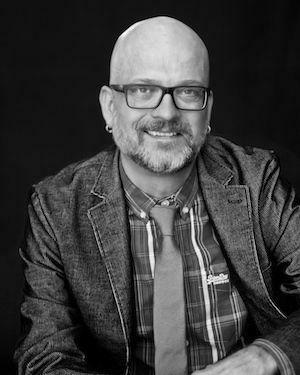 As an Associate Teaching Professor of Costume Production, Hugh teaches classes in Draping, Tailoring, Flat Patterning, Stretch Techniques and Classical Dancewear including tutu construction. Hugh brings to Carnegie Mellon vast experience as a draper and craftsperson. His career has included 84 Broadway shows and an even greater number of operas, dance pieces, films, circus acts, concerts, cruise ship shows and figure skating programs. Highlighting his Broadway work are shows such as Something Rotten!, Aladdin, Drowsy Chaperone (Gregg Barnes); Newsies, The Rivals, Jersey Boys (Jess Goldstein); Cinderella, 9 to 5, The Frogs, Curtains (William Ivey Long); Anything Goes, Gypsy, Thoroughly Modern Millie, The Pirate Queen (Martin Pakledinaz); The Coast of Utopia, Cry Baby (Cathy Zuber); Addams Family (Julian Crouch); Spamalot (Tim Hatley) and Ragtime (Santo Loquasto). Films include Mirror, Mirror (Eiko Ishioka); Doubt, Julie and Julia (Ann Roth); Elf (Laura Jean Shannon) and The Mirror has Two Faces (Theoni Aldredge). Hugh’s draping and craftwork have been seen on the stages of the Metropolitan Opera, Chicago Lyric Opera, Washington National Opera, Houston Grand Opera, Santa Fe Opera, Norwegian Cruise Lines, Disney Cruise Lines, American Ballet Theatre, New York City Ballet, San Francisco Ballet, Ringling Brothers Circus and Big Apple Circus. From 1992 until his appointment at CMU, Hugh served as a draper for Carelli Costumes, New York City where he initiated the craft department. In addition, Hugh has designed costumes at many regional and educational theaters in the US. For over twenty years he has worked at the Shakespeare Theatre of New Jersey (Henry VIII, Wittenberg, A Most Dangerous Woman, Richard II, The Lion in Winter) and Fairfield University (Measure for Measure, As You Like It, The Rover). His designs have also appeared at The Colorado Shakespeare Festival (Henry IV Part One, Henry V, Comedy of Errors, Merry Wives of Windsor), Portland Stage Company (A Song at Twilight, Color of Flesh, Words by … Ira Gershwin) and George Street Playhouse (Lend Me a Tenor). Hugh holds an MFA in Costume and Scenic Design from the University of Hawaii at Manoa, Honolulu HI and a BA in Theatre with minors in Music and English from Concordia College, Moorhead MN. He is a member of USITT and Omicron Delta Kappa. You can see examples of his production and design work at hughhanson.com.